If you're looking for a truly concert ready snare drum at an affordable price, the Black Swamp Concert Maple Snare Drum is for you. Each drum is checked, tuned, and tested by a professional percussionist before leaving the factory. 10-Ply Maple shell with concert bearing edges and snare bed. All drums are precisely machined on a 5-axis CNC machining center for consistency and quality. Smooth die-cast strainer - tough and durable yet smooth and quiet. 2.3 mm Triple Flanged counterhoops and die cast lugs, and topped off with an Evan G1 batter head. Black Swamp Wrap-Around Cable Snares (Blue Cable/Bare Cable combination) balances a robust tone with sensitivity. Just played this drum. Really nice sound, beautiful finish. 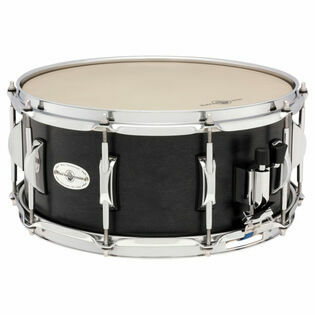 Great Drum for anyone looking for a one and done type purchase.